Sunday's finale caps a season filled with fresh, pretty, pretty, pretty, pretty good Larry David-isms. Larry David plays new word games in the latest season of "Curb Your Enthusiasm." Larry David injured his shoulder in the latest episode of HBO's "Curb Your Enthusiasm" while wrestling Lin-Manuel Miranda over the "boss chair" – the elevated, power-seat behind the desk of a fancy office. David lost the fight to the much younger "Hamilton" mastermind. But the ninth season of "Curb" ends this Sunday with David re-occupying the throne of TV phrase-creating king. He's extended a reign he began with "Seinfeld," which introduced "master of your domain," "close talker" and "not that there's anything wrong with that," among other sayings. 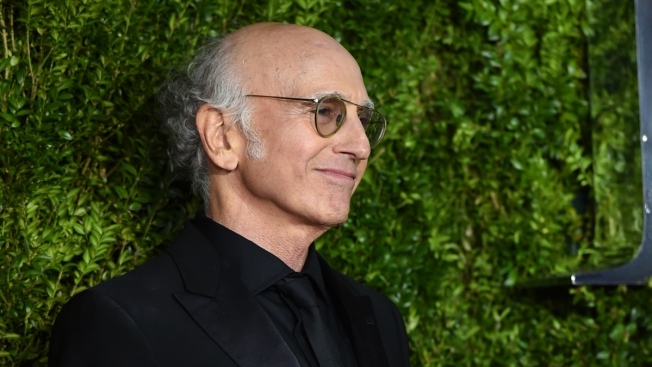 David has long used "Curb" to over-analyze and label everyday human interaction – no more so than this frequently hilarious season, which, like every outing, could be his last. • The Art of the "Foist": David repurposed "foist" in the context of pushing an unwanted person into the life of an unsuspecting dupe. Case in point: David foisted his incompetent, constipated assistant (played by Carrie Brownstein) onto his frenemy Susie Greene (Susie Essman). • Type + Distance = No Door Hold: David's formula for whether to hold open a door for a stranger walking behind him adds up to disaster – thanks to his pathetically erroneous assumption on whether the woman (played by Julie Goldman) was the "type" who wanted a door held opened for her. She later overcharges him for a haircut. He inadvertently breaks up her planned marriage to her girlfriend. • Patient-Doctor Confidentiality: David's shrink (played by Bryan Cranston) invokes this twist on doctor-patient confidentiality after David tells his ex-wife the doctor loves truffles. Cranston's character takes revenge by conning David into buying him a new office chair (fights over chairs – including Larry's seat battles with Richard Lewis – are a Season 9 theme). • Haskell Rights: David digs deep into sitcom history to assert his right to go upstairs at will in the Greene home. It's a reference to Eddie Haskell, the young, obsequious family friend on "Leave it to Beaver," who ingratiated himself with June Cleaver. • Never Wait for Seconds: David loudly decrees at a restaurant that anyone who already has waited in a buffet line can cut the queue when getting seconds. The beneficiary of the declaration – an assassin (Navid Negahban) who planned to carry out a fatwa on David (a Season 9 plot line) – is so touched, he successfully makes a case to remove the death sentence. • The Accidental-on-Purpose Text: David's latest social subterfuge can be defined as pretending to accidentally send a text to the wrong person to make yourself look good and/or to get your own way. Case in point: Jeff (Jeff Garlin) "accidentally" sends Susie a text purportedly meant for David. Jeff writes he can't go to the Rams game with David because he needs to drive Susie to the airport – hoping she'll appreciate that he’s a good guy and let him go out of guilt. Susie sees through the ruse, though the accidental-text-on-purpose seems destined to enter the ranks of top "pretty pretty pretty pretty good" Larry David-isms.